Now that we are past Thanksgiving, it’s time to think about all things gingerbread! 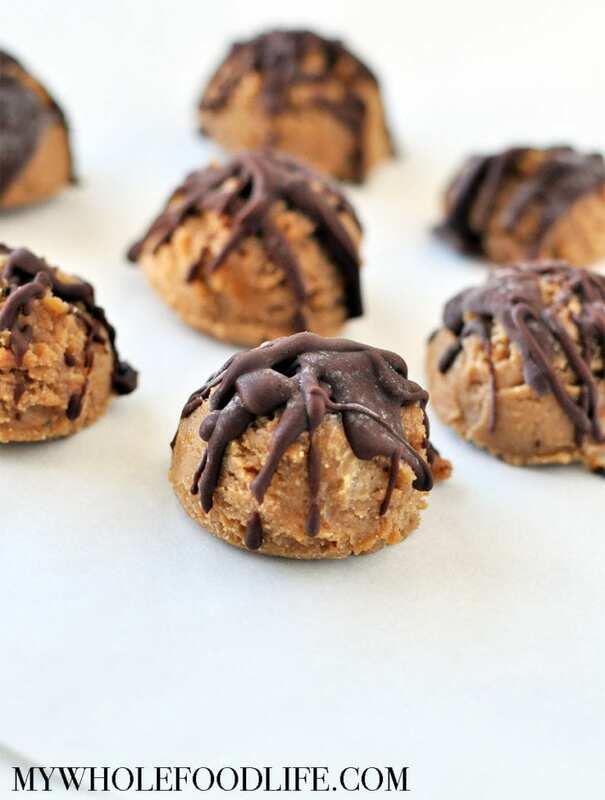 Starting with these No Bake Gingerbread Chocolate Cookies. Does it get much easier than no bake? I don’t think so! These little bites of deliciousness will rock your world. I promise! These gingerbread cookie dough bites are vegan, gluten free, and paleo. Marcus was begging me to take a picture fast so he could eat them all fast! That is a common problem here. I make something delicious, and then nobody can eat it until it’s photographed. Sometimes it takes several days before I can take pictures and in the mean time, he has these staring him in the face every time he opens the freezer. I made a quick video to show how to make these delicious cookies. For more videos, you can subscribe to my You Tube Channel. No Bake Gingerbread Cookies drizzled in creamy chocolate. ZERO refined sugar, vegan, gluten free and paleo. Make them in a few minutes time! In a food processor , combine the cookie ingredients. Blend into a dough. Using a cookie scoop , form cookies and drop them onto a lined baking sheet . Place in the freezer while you make the chocolate coating. Combine all 3 ingredients for the chocolate in a mixing bowl . Whisk together. Once mixed well, drizzles over the cookies with a spoon. Place back in the freezer to set. Enjoy! Keep these cookies stored in the freezer. They should last several months that way. Enjoy! Would coconut flour work in place of almond flour? I'm not sure coconut flour will work. It can be quite fickle to work with. Honey or agave should work in place of maple syrup, but molasses is a key ingredient in gingerbread recipes, so it may taste different if you leave it out. Can I substitute the cashew butter with another nut or seed butter,due to an allergy? Thanks, they look delicious! Almond butter works. So does sunflower butter. Peanut butter may have too strong of a flavor to work, though. I love this recipe! Bring on the gingerbread! I don't have blackstrap molasses, but I do have plain unsulphered molasses. Would that work?